The RescueShot Case is a versatile, rugged epinephrine auto-injector case that allows you to easily carry your emergency auto-injector with you at all times. This case was designed for people on the move, and can be worn on a belt with the rotating belt clip and can be attached to a briefcase/knapsack by using the attached loop (clip sold separately). It is made from strong ballistic nylon, and has a clear pocket on the back to store emergency contact information. This case can hold one or two (most brands) auto-injectors. This physician recommended case is great for military, EMS personnel, athletic programs, and anyone on the go who has been prescribed an epinephrine auto injector! Be safe, by keeping your epinephrine auto-injector with you at all times! 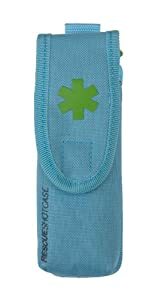 Fits one or two most brand Epinephrine Auto-Injectors (Epinephrine Injectors Not Included) Made from heavy duty ballistic nylon Rotating swivel belt clip Top loop for hanging from a briefcase or stroller (carabiner not included) Clear pocket on back for emergency contacts, information, etc.